Edinburgh Castle- Symbol of the city! The magnificent castle stands atop a volcanic crag towering over the city skyline. 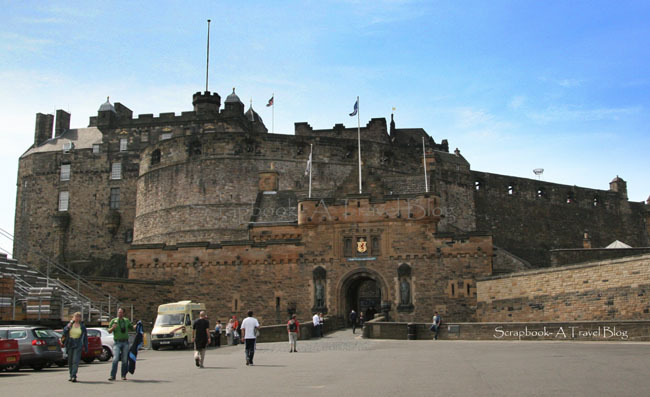 Scotland trip is incomplete without visiting this massive medieval castle which is 'the best' attraction of Edinburgh, in fact- is the symbol of the city :) From here visitors have spectacular panoramic views of the Edinburgh city in every direction. 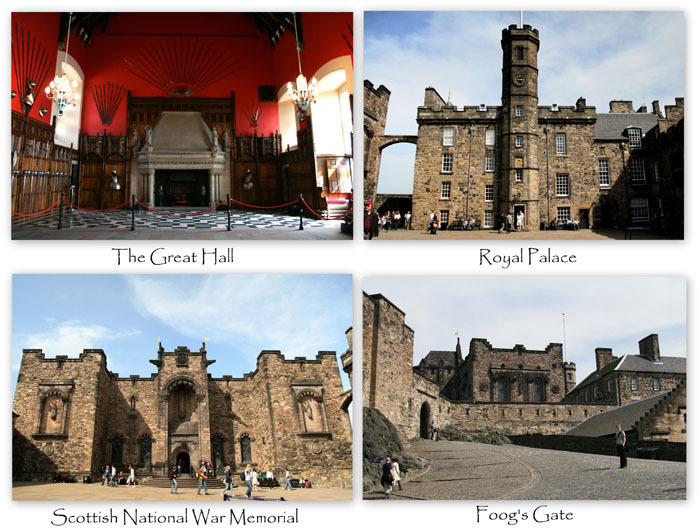 Situated at the beginning of the Royal Mile, the castle displays the 'Honours of Scotland' (royal jewels). Being a part of national heritage of Scotland the castle was believed to be built as a royal residence in 12th century. Castle has seen many wars and battles and present day building date back to only 16th century. Oldest surviving building is St Margaret's Chapel. Now, the castle is major tourist attraction in Edinburgh and houses museums and memorials which are mainly located in the upper ward. The Foog's Gate is the major gate to the upper ward where all the tourists throng. The Crown Square here is the heart of the castle. The Great Hall in the Crown Square is then a chief place of State Assembly where people honored the king. It has a spectacular hammerbeam roof which is reconstructed to its original looks. The Royal Palace adjacent to it was home for the Scottish royalties which is now converted to a museum. The Stone of Destiny and Honours of Scotland or the Royal jewels are displayed here. The Scottish National War Memorial is all about the Scottish casualties in all the wars including first and second world wars to Korean and Gulf wars and many more. The names of the dead are written on the books which are on permanent display. Located in the crown square, it is a serene hall of honor and shrine. Right opposite to the Royal Palace is the Prisons of War. It seems even the Pirates of Caribbean were imprisoned here. Nothing much to see in those stone vaults, they seemed very scary! On the outer side of the Crown Square one could visit Regimental Museums and National War Museum of Scotland which display artifacts about wars, Scottish wars, from war heroes to war apparel, weapons, pictures, letters and so on. St. Margaret's Chapel- being the oldest building survived in the castle’s walls, is a memorial built in the honor of St. Margaret who was known for her devotion to the church by her son David I. It has very beautiful stained glass windows. Mons Meg- One of the surviving bombard guns and was a wedding gift to the King James II. Hmmm what a massive gift !!?? She can fire a 150KG gunstone up to 2 miles! Half Moon Battery- This magnificent set of defence is built on the ruins of David's tower after it collapsed in one of the bombardments. One o' clock gun is fired at 1:00PM everyday and so is the name! It used to be a time signal for the ships then, and now just a tradition and tourist attraction. The castle takes you back in time to the medieval era. The views of the city from here are spectacular. I did spend almost half-a-day here trying to see most of it. I was trying to avoid any revisit thinking about the expensive entry tickets (16 sterling pounds)! Souvenir shop is nice, but I bought only a fridge magnet. I chose to buy a woolen scarf for my Father from the market. It was a great experience something different than that I have seen in India. Edinburgh- The ancient modern city! This post linked to Skywatch Friday. What a wonderful, interesting post, Kusum!! And your captures are terrific as always!! Looks as though you had a great trip!! Thanks for sharing!! So much of history. Great series of pics. The sky looks lovelier with a magnificent castle under it. I'll take note of this landmark for when I visit Edinburgh. That's what I call an impressive castle. This post brings back memories of when I did my midwifery in Edinburgh. The castle is a magnificent building as indeed the city is a wonderful place. Have a great weekend. What a great place - I have very fond memories of going there for the Festival - many, many years ago! Each of these historical sites reminds us of the magnificense that surrounds these structures! Seven days of my Kashi Yatra!